Topics: Business, Flights, Holidays, Hotels, Money, and Real Estate. accessgambia.com Gambia Hotels Finder - Access Gambia | Web Directory & Info. 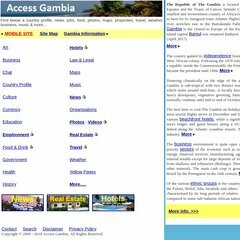 accessgambia.com Gambia Music Site - Access Gambia | Web Directory & Info. The site has about 819 users daily, viewing on average 2.30 pages each. Its IP Number is 66.96.133.2. Its 2 nameservers are ns1.dot5hosting.com, and ns2.dot5hosting.com. The Endurance International Group Inc (Massachusetts, Burlington) is the location of the Nginx server. PING www. (66.96.133.2) 56(84) bytes of data.